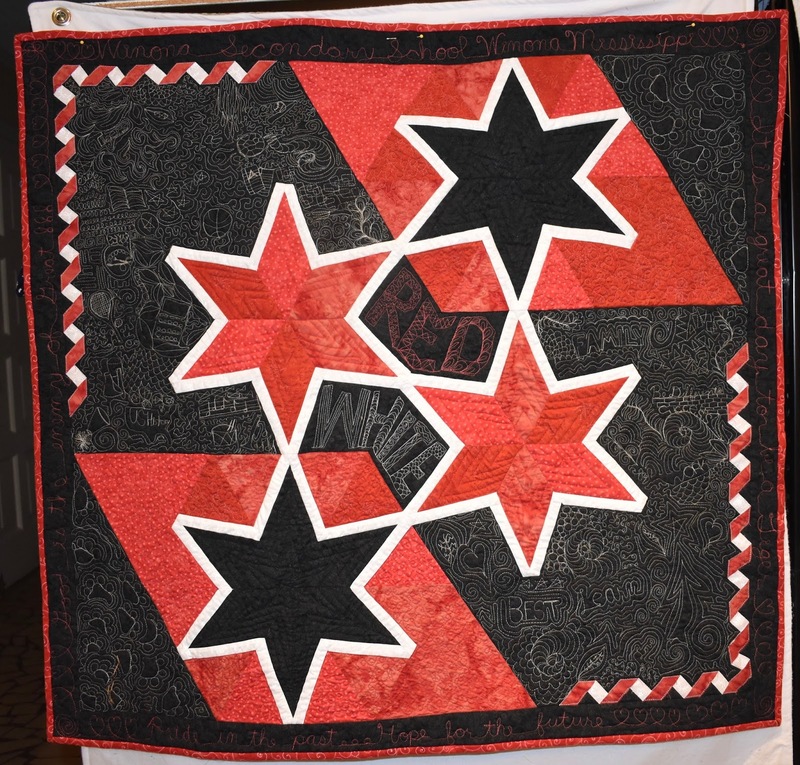 Another quilt I finished last fall was my Cookie Cutter Stars quilt that Barbara Cline designed for the Mississippi Quilting Association. I had decided that I was going to make it using material that I had on hand. In addition, I have wanted a quilted wall hanging for my classroom for a while, so of course I wanted it in school colors. Red and white are the official colors but, we also use grey and black. So I chose to do it in a variety of reds, black and white. So each summer MQA hosts a nationally known teacher. Last July it was Barbara Cline from Virginia. She is the sister of one of my local guild members Julia Graber. She has written a number of books, I have 3 of them I think. You can go to her shop here. Anyway she developed a new pattern that was only available to MQA members to teach. She has it in her shop now. It is called Cookie Cutter. I learned several new techniques, which is wonderful! Barbara has a way of inserting a fabric into a piece of fabric and she outlines that technique in her newest book. Anyway, she taught us that technique and others too. The two sided fabric twist at the corners was another technique that was new to me. I quilted this using a graffiti quilting technique I had been seeing quilting teachers like Angela Walters do on youtube. I had also watched videos by Karlee Porter. The other inspiration came from a book I have had for a while by Laura Lee Fritz. I created my own design of for the top right corner and bottom left corner of tiger paws, since we are the Winona Tigers. In the top left I quilted symbols for all the different subjects and activities I could think of. In the bottom right I did words that I think of when I think of our school. Around the edge I quilted words. 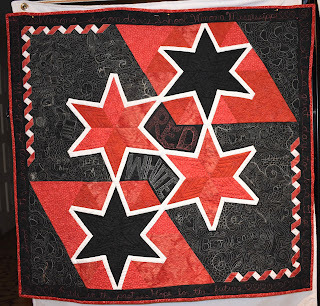 I did echo quilting on the stars and stipple quilting on the red background areas. This quilt is 38 x 38 and is hanging in my classroom. I put fabric with numbers on the back as I teach high school math. No one will ever see it since it is a wall hanging, but I know it is there. Have fun with your quilting from start to finish. Thank you Barbara! !